Why a Vinyl Wrap Trumps a Paint Job. 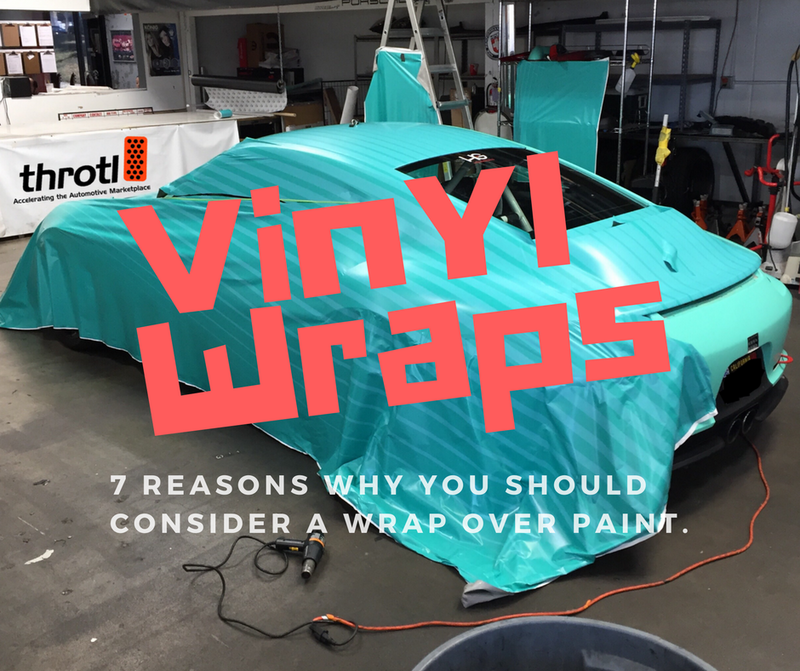 We hear the question all the time, “Why should I wrap my car instead of painting it?” The answer is like this. A paint job can range from $3,000-$10,000+ depending on the quality and paint procedure. Whereas a vehicle wrap can cost $2,500-$5000+ depending on the the material and extent of the project. Partial wraps such as roofs, hoods, chrome trim blackouts, and other accents are also a great way to get started beginning at around $300. Along with this much cheaper price tag comes MANY benefits that paint cannot offer. Paint quality can vary especially whilst looking for a cheaper price. Cheaper paints will look great at first, but within a few years can show wear and tear resulting in the paint job needing to be redone. Professionally installed vehicle wraps will leave your vehicle looking top notch for years. Cost: As stated previously, a high quality paint job can range from $3,000-$10,000+ depending on the color, paint shop, and quality of the paints. Professionally installed films with the highest quality materials can cost $2500-$5,000+ and will have a life expectancy of 4-10 years vinyl depending. For a fraction of the cost of paint, one can choose to wrap their vehicle for as long or little as one desires. Tons Of Options: Upon purchasing your vehicle you may have wanted something different, or possibly a color that is not available in factory paint. This is where vinyl wraps will allow all of your car fantasies to come true. You will be able to stand out from all of the others and have a truly one of a kind vehicle that suits your personality. If after a few years you are looking for change once again, just remove it and choose a new color! Transform your vehicle every few years and keep everyone guessing! Installation Time: When choosing to paint your vehicle you are allowing yourself to be without transportation for up to two weeks or longer. When it comes to wrapping a vehicle, your car can be fully transformed within 3-5 days and ready to be picked back up. Don’t leave yourself stranded, wrap it! Protection: Every covered inch of your vehicle in vinyl is protecting your factory paint from all natural hazards and weathering, and won't be affected by prolonged sun exposure. Vehicle wrap vinyl is a very durable ~3mill thick material and will act as a shield. Say goodbye to stone chips, abrasion, and other natural hazards! So, the choice is yours. But these are some pretty compelling points why a wrap might be the right choice for you! “7 Reasons Why Wrap Your Vehicle vs Paint.”. * Exotic Vehicle Wraps blog. Exotic Vehicle Wraps, April 14th, 2014. Web. 25. March 17.